Per Lincoln Stars GM Jon Hull, the team has acquired '97 forward Grant Jozefek (5'9", 180 pounds) from the Muskegon Lumberjacks. It was not announced what the Stars sent to Muskegon for the rights to Jozefek. Grant was originally selected by the Muskegon Lumberjacks in the first round (7th overall pick) in the 2013 USHL Futures Draft. Click here to read a good article about Jozefek's background. 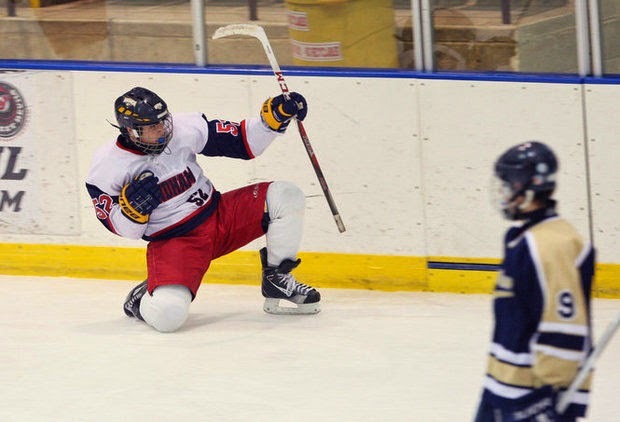 In December of 2013, Jozefek committed to play college hockey at Northeastern University. Click here to read more about that. According the article I just linked, Grant is expected to start at Northeastern the fall of 2016. So that means we could see him in a Lincoln Stars uniform for at least the next two seasons. This past season, Jozefek completed his sophomore year at West Morris Mendham High School in Menham, New Jersey. Grant, who hails from Chester, NJ, scored 103 points (45g, 58a) in his sophomore season before going on to play 22 games with the Jersey Hitmen U18 (USPHL) team where he scored 35 points (14g, 21a). In 2012-13, Jozefek became the first freshman in New Jersey state high school history to score 100 points in a season when he scored 103 points (51g, 52a) in only 24 games played. The Lumberjacks called up Jozefek in November of last season to play one game against the Youngstown Phantoms. In that game, he put two shots on goal but was held scoreless. Click here, here and here to watch some videos of Grant in action from this past season. He wears #52 in the videos. On paper, this looks like a great addition to the team. The Stars add yet another talented '97 forward to the lineup. Lincoln may have a young squad up front this upcoming season, but they will be skilled, quick, and exciting to watch. Sounds like a good pick up....another young and talented kid...can't wait for hockey season to start! Jozefek will be a legit stud, just needs an opportunity to shine. any word yet on what the Stars gave for Grant?